Topshop Bardot Midi in Olive. Also available in black. Diane von Furstenberg Floral Silk and Cotton-blend Dress. It's getting warm here in the South and it's the start of the third quarter. That means school will be out in about six weeks or so and Summer will be here before you know it. In the same way that I am trying to lock down all those camp medical forms and get all my work projects on "accelerate" mode this week, I also want to lock down wardrobe essentials for my kids and myself so that we are ready when Summer kicks it into high gear. And, when it starts getting hot, for my wardrobe, I have become a 100 percent total devotée of the casual dress for a number of reasons. First, comfort. For the most part, dresses are way cooler in the summer, probably because they fall away from your body. (Definitely cooler than jeans or any pants options and I just can't really do shorts anymore). Second, they are so much easier. When I am rolling my regular everyday race-against-the-clock in the bathroom and I have T-5 minutes to be out the door, I feel so successful and tremendous relief when I know I can walk in my closet, lay my hands on a dependable dress that looks smart (that doesn't require special undergarments) and is flattering, and be out the door with 3 minutes to spare. This is one of the main reasons that dresses are my top travelling companion. If I just need underwear and a pair of shoes, I can just relax about everything. Yassss, girl. Finally, wearing a dress kind of kicks it up a notch without trying. More refined than a pair of shorts but totally casual at the same time. I love how I can wear a dress to lunch and then change my shoes and throw on some earrings and be ready for dinner out in the summer. So, enough blabbering about why I love a dress in the summer. 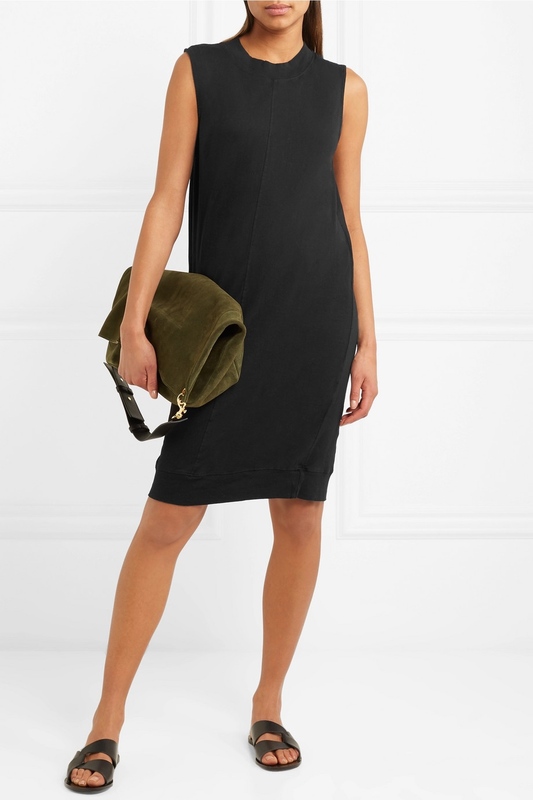 Vince Cotton Poplin Shirt Dress. Grab this chic belt and this bag and represent the stylish people. 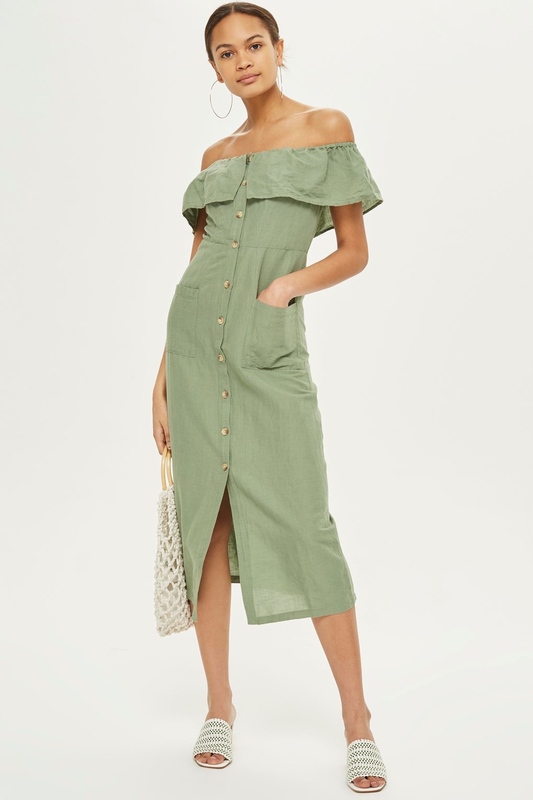 Topshop Linen Bardot Midi Dress. Everyday chic at a bargain. Comes in my favorite, black, also. Bassike Organic Cotton Jersey Shift Dress. Wear it with these sandals and these earrings and show the world that you are cool without ever even trying. Theory Twist-front Stretch-jersey Midi. A true workhorse. This baby will come through for you when you need her most. Need something you can wear with sneakers that is cool and comfortable? This is your girl. There are a million pairs of Stan-Smith-inspired sneakers out there these days and anything like that will look fab with this dress. 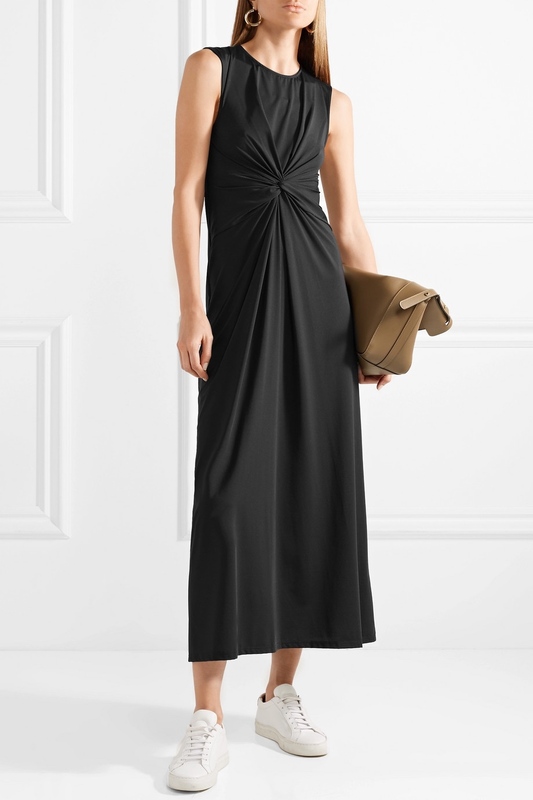 Or, to elevate the look, wear her with a chic sandal like this slide and this tote and you will Shut. It. Down.